In 2014, the US Health Resources and Services Administration (HRSA) awarded SEAHEC our second Network Planning Grant in two years. The aim of the newly launched Arizona Community Health Workers Network was to build a coalition to create a state-wide network to support Arizona’s Community Health Worker (CHW) workforce. 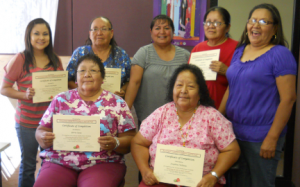 Despite Arizona’s long history of community health worker “CHW” advocacy and research, the CHW occupation remains a poorly understood and underutilized resource in Arizona’s healthcare industry. By uniting rural and regional CHW interest groups across ethnic, racial and geographic sectors in Arizona, the Network is increasing access to care by enhancing the capacity and integration of the CHW workforce in primary care and health promotion. Our broad based network represents community health workers, their employers and diverse members of the health care community. Through developing a community health worker workforce that is both sustainable and integrated into health care teams, we address our most pressing issues of access to health care for the most disadvantaged residents of Arizona. 4. To assess CHW workforce capacity both to expand access to health services and to integrate CHWs into the primary health service delivery system within our State. The benefits of the Network are being felt state-wide, as the work of our diverse agencies with broad scope and reach help transform the way in which health services are offered.